Sweet chestnut (or Castanea sativa ) is a natural, sustainable, resource which grows without the use of pesticides and grows well in the southern counties of England. We believe sweet chestnut products can truly be described as eco or environmentally friendly. 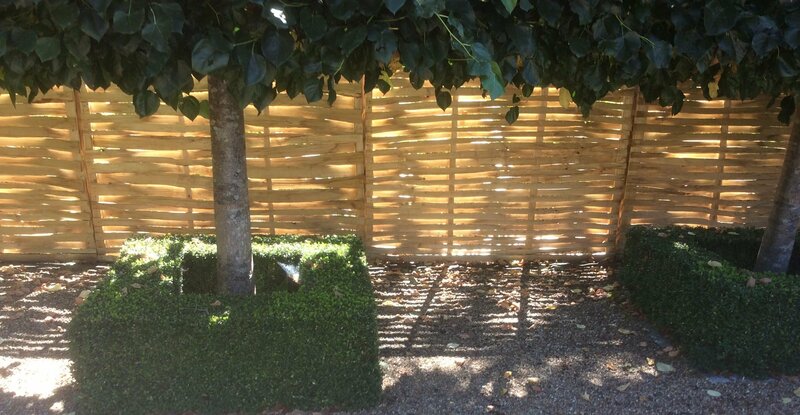 We make chestnut panels by hand, weaving cleft slats to create durable and attractive panels. 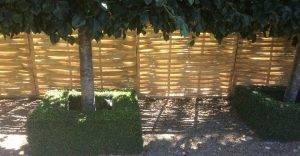 Great for creating a look which is quite different to standard panels- ideal for creating a rustic feel in a garden. 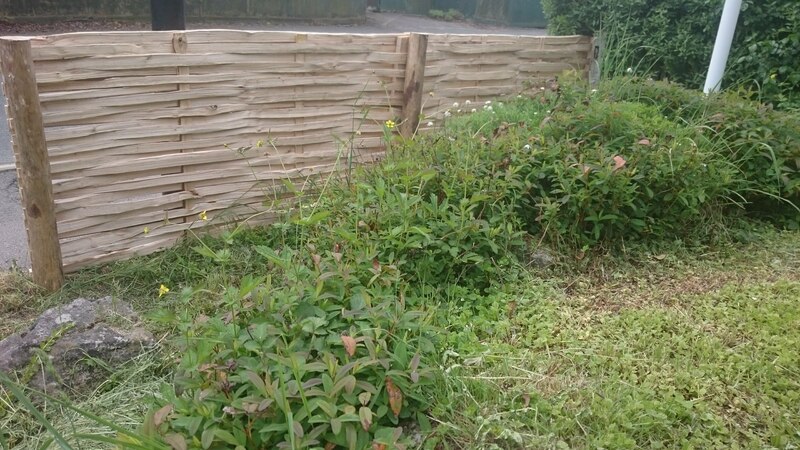 They have also been used to guide bees away from a neighbour’s property! They can be made to size, up to 6ft by 6ft. As with other sweet chestnut products, when first cleft the wood is bright, fading over time to an attractive silver grey finish. Please contact us for more information about prices and delivery. 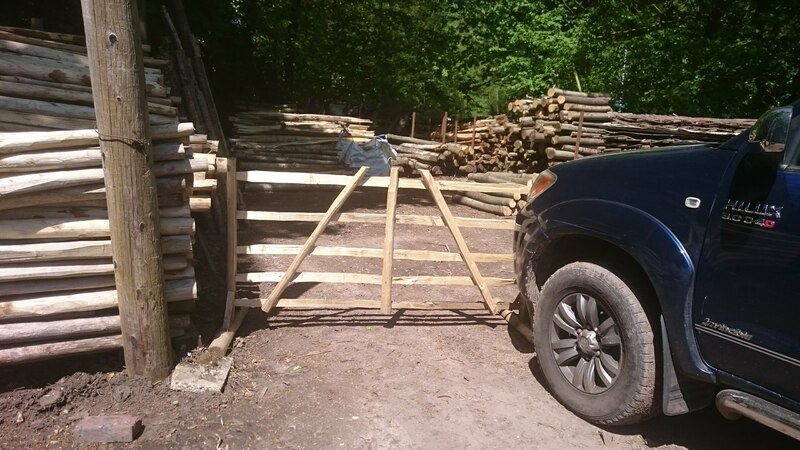 We also make 5 bar cleft chestnut gate hurdles . 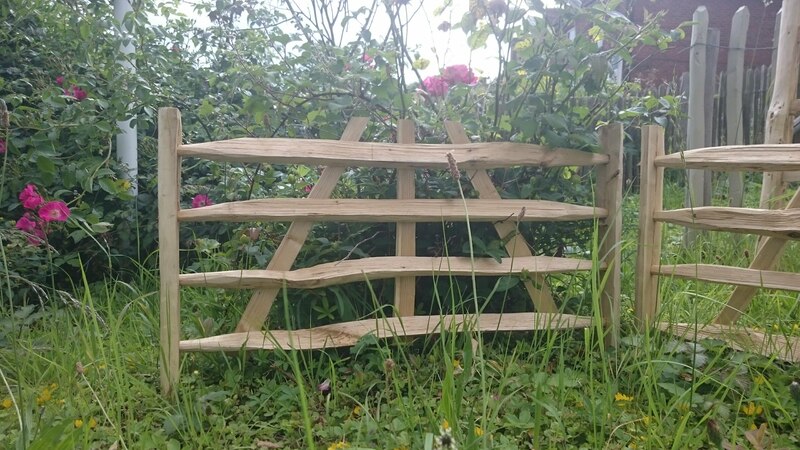 They are made by hand and they can be made as mini hurdles or up to 10 feet wide. 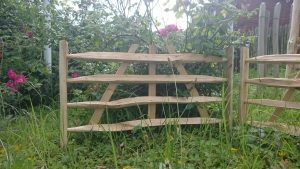 Traditionally these were called sheep hurdles but these days they are often used for boundary fencing, edging flower borders and lawns, holding up shrubs and even for fencing in ducks! 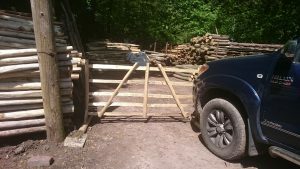 Our free standing hurdles make an attractive, strong, temporary fence which can be used to block access to restricted areas or guide people along a desired route. Made from sweet chestnut and using traditional methods, they are an excellent solution for guiding the public in situations where modern, industrial products would look out of place. 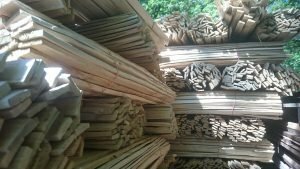 We supply riven cleft laths from sweet chestnut for lath and plaster ceilings and walls. 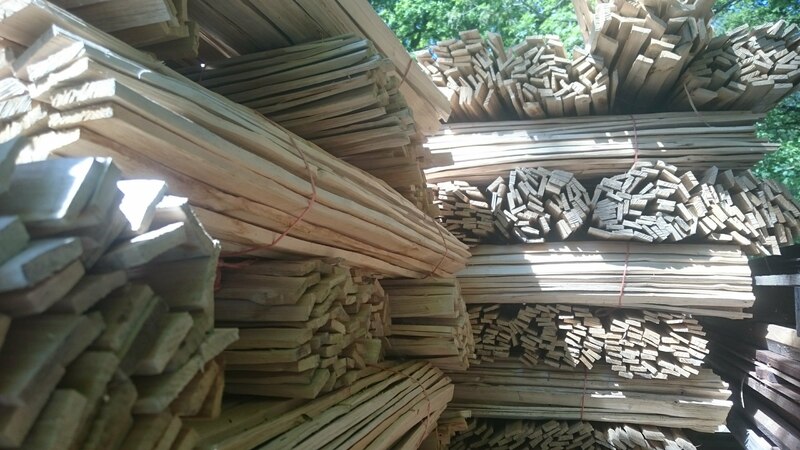 They are cleft by our skilled craftsman, Mark, who has been making laths for over 20 years. Please contact us to discuss your requirements. 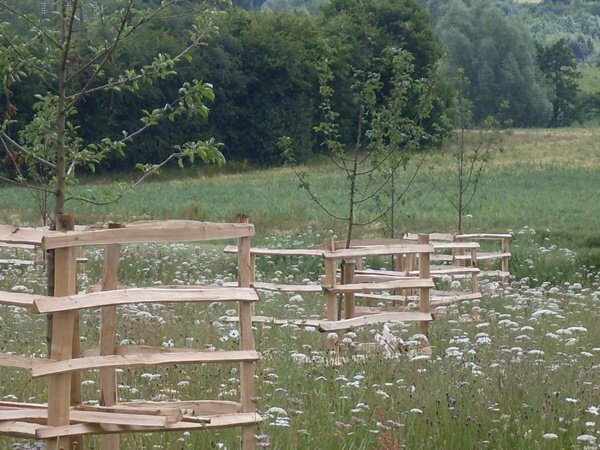 If deer nibbling your trees is a problem , then these attractive cleft chestnut frames might be the solution . Please contact us to discuss your requirements. Coppicing is a harvest; we are harvesting sweet chestnut timber. 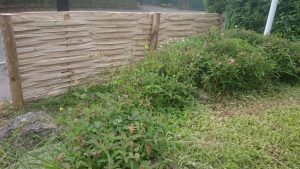 Far from devastating the forest (as those who feel cutting any tree is a crime would have us believe), coppicing encourages new growth and is hugely beneficial to wildlife and a host of plants, moths and insects. Bluebells run riot after fresh cutting and, combined with mature Oak and Ash ‘standards’ (these are trees which are left, maybe four to six cycles of coppicing, until old enough for sawn logs), chestnut coppicing produces a wonderful woodscape and superb woodland husbandry. Sweet Chestnut is best cut during the winter months from late October till the end of March (“the cutting season”). This is known as “winter-cut” chestnut. This “winter-cut ” wood lasts longer than wood cut in the summer months because there is more sap in the wood during the summer . April to September is the growing season and new shoots will put on up to 10 feet of growth in those 6 months. We aim to cut our Sweet Chestnut every 15 years. All the Sweet Chestnut we cut grows within 12 miles of Haslemere and would have been planted some 80 to 100 years ago. Each tree may well have been coppiced (cut) seven times since it was planted. If you’ve thought of planting a tree to offset carbon consumption, then it’s worth remembering that it is not your only option. Buying local sweet chestnut products makes a real difference too because every time we coppice, the new chestnut growth starts absorbing CO2 almost immediately – there’s no need for us to replant trees. 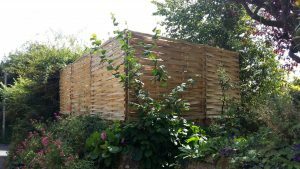 So, next time you need a post, a fence or a pergola pole, a walking stick or roofing shingles for your shed, buy local Sweet Chestnut timber instead of treated softwood. No tree will have been permanently cut down to make your items and the wood will not have been transported many hundreds of miles by sea or by road. The cutting of chestnut coppice creates a fantastic carbon sink. This traditional craft is environmentally sustainable, low impact and keeps our rural communities thriving by employing local forestry workers. 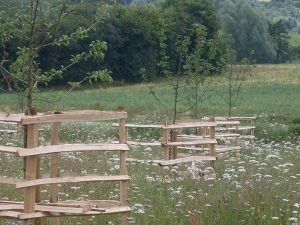 Oh and we don’t use chemicals or pesticides on the chestnut – neither in the woods nor on the fencing itself. A truly “green” wood .